In 1886, William Temple Hornaday set out for the untamed West to collect American bison specimens for the U.S. National Museum. Just a few years earlier the bison herds of North America had been estimated in the millions. But Hornaday had a hunch that had changed. He was right. The taxidermist was barely able to find enough specimens to preserve for the museum, and the rapid slaughter of America’s bison herds would drive him try to fight for their survival and that of other wildlife for the rest of his life. In “Mr. 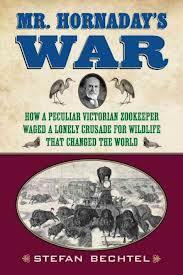 Hornaday’s War: How a Peculiar Victorian Zookeeper Waged a Lonely Crusade for Wildlife that Changed the World,” author Stefan Bechtel documents how Hornaday went on to write essays and books that would bring the plight of the buffalo to the attention of Americans, but be too late to do anything about it. Hornaday eventually became the most influential conservationist of the 19th century, devoting his life to protecting endangered species. Stefan Bechtel has written ten other books that have sold more than two million copies and been translated into a dozen languages, including Tornado Hunter about "boy genius" storm chaser Tim Samaras, and Roar of the Heavens about 1969’s Hurricane Camille. He is a founding editor of Men’s Health magazine, and his work has appeared in Esquire, the Washington Post, American Way, and other publications. During World War II, a small group of British and American scientists worked tirelessly to defeat the German U-boats that were wreaking havoc on allied commerce. Armed with a dogged determination and a fair amount of mathematics, physics and probability theory, they forged the new field of operational research and forever changed how wars were fought and won. When President Franklin Roosevelt selected mild-mannered University of Chicago history professor William Dodd to serve as America’s ambassador to Nazi Germany in 1933, neither man had an inkling of the coming terror. In fact, Dodd accepted the post in part because he believed his light duties would allow him time to complete his exhaustive history of the American South.